They shimmer in the sunlight, require no artificial lighting during the day and blur the lines between indoors and out, welcoming the landscape into lobbies and living rooms. 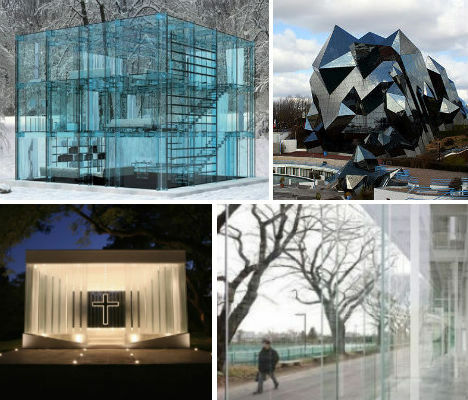 These 13 buildings make stunning and often unusual use of large amounts of glass, whether choosing it as a facade material around a more conventional building, capitalizing on its dreamy diaphanous effects or using it to visually expand a space (sometimes at the expense of privacy). 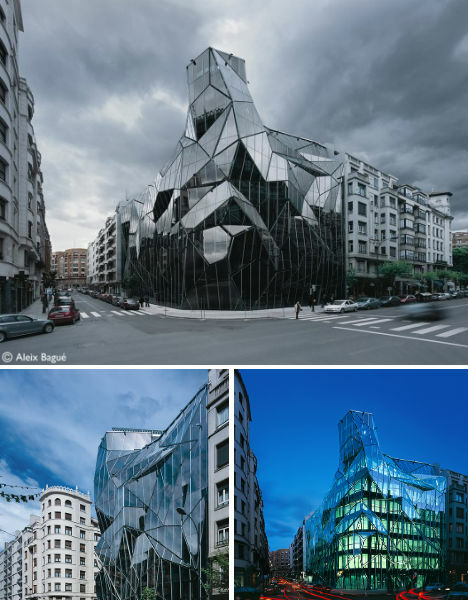 The Basque Health Department Headquarters building in Bilbao was in need of an energy-efficient update, but rather than tearing down the whole building and starting anew, Coll-Barreau Architects gave the existing building a faceted glass facade that not only insulates the building, brightens it up and enables ventilation, but also makes a dramatic street-side statement. The unusual shape of the facade was partially the result of strict city zoning rules. The lines between indoors and out are blurred in the crystalline Kanagawa Institute of Technology studio and workspace, designed by Junya Ishigami and Associates. With floor-to-ceiling glass, the building is totally transparent, giving students an incredibly bright space in which to work during the day, and turning it into a veritable art installation at night. Inside, supportive columns are arranged to subtly define ‘zones’ of the building without walling them in and cutting them off from the rest of the space and all of that natural light. Conceived as a perfect cube with half of it buried beneath the surface of the earth, the Netherlands Institute for Sound and Vision in Hilversum is a dreamy vision in modern stained glass, gleaming in shades of red, blue and yellow. Housing a museum and offices as well as the national broadcasting archives, the interior design is a conceptual translation of Dante’s “Divine Comedy” with blood-red corridors and an atrium that architects Willem Jan Neutelings and Michiel Reidijk call their “inferno”. 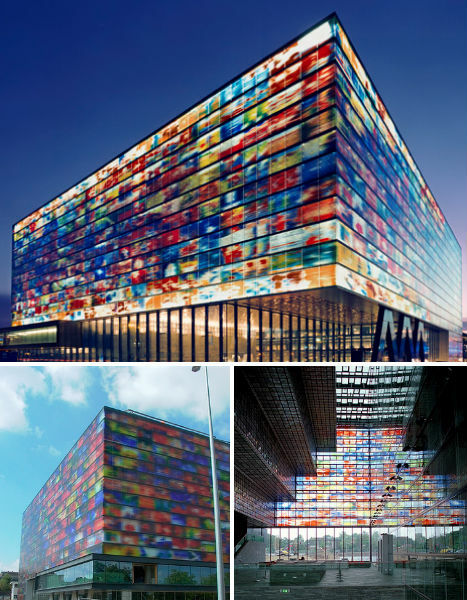 The colored glass panels that seem abstract from afar are actually famous images from Dutch television. 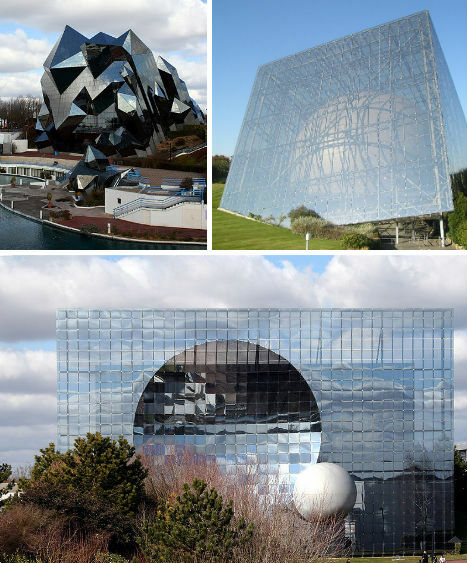 Vienne, France glitters with a series of brilliant glass buildings that together form Parc du Futuroscope, a theme park based on multimedia, cinematographic futuroscope and audio-visual techniques. The faceted cinema is harsh and jagged, calling to mind crystal shards, while L’Omnimax is a sphere encased within a glass box. A third structure, L’Imax 3D, is covered in mirrored glass tiles. Most of us work in uninspiring office spaces that seem to have been designed with blandness and disconnection from nature in mind. We can only dream of gazing up at the treetops like the lucky workers who spend their days in the Madrid offices of Spanish architecture practice Selgas Cano. 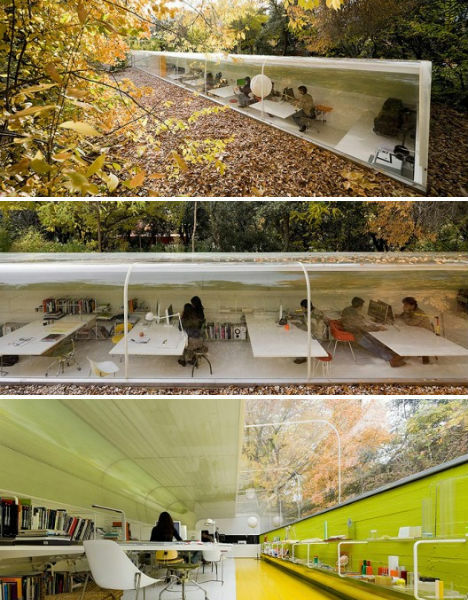 The tube-shaped office is sunken into the ground and features one long wall of windows, giving occupants the feel of being completely immersed in the woods. 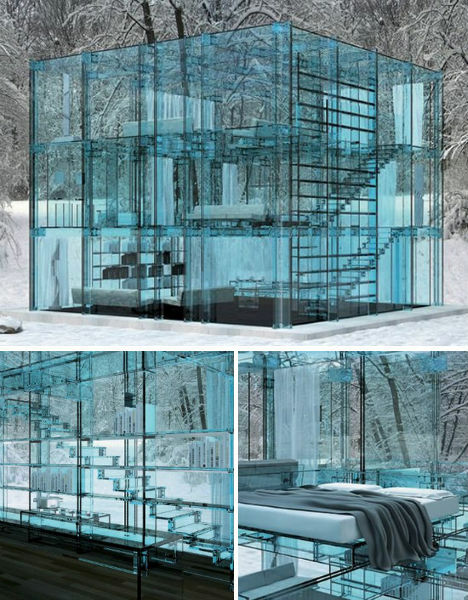 Could you live in a glass cube such as this, where even the walls and stairs are transparent? Designed more for aesthetics than practicality, the Glass Home by Carlo Santambrogio and Ennio Arosio was built to showcase the pair’s ‘Simplicity’ line of furniture. While it’s difficult to imagine living life quite this – transparently – the building itself, viewed as an art object, is quite beautiful to behold. 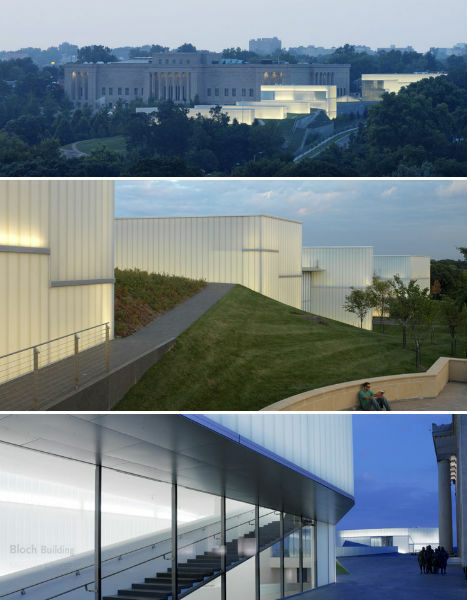 Steven Holl’s stunning addition to the Nelson-Atkins Museum of Art in Kansas City consists of five interconnected frosted glass boxes that occupy the sculpture park of the much more conventional existing museum. At night they become like paper lanterns in the grass, luminous and seemingly ephemeral. The ‘Bloch Building’ brings the museum, built in 1933, firmly into the 21st century, not only with its unusual exterior but with the visually engaging yet appropriately blank white gallery space inside. 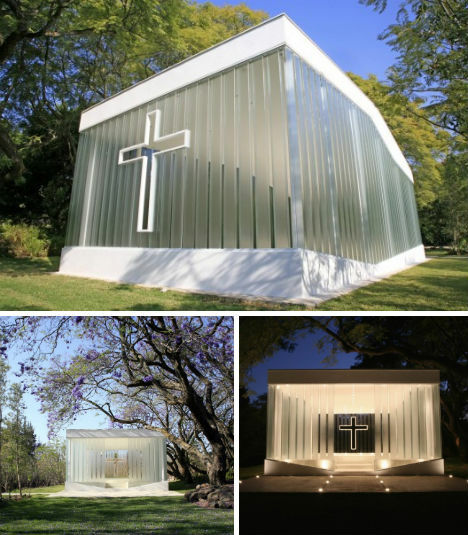 When a young architect from Bunker Arqutectura wanted to get married at La Estancia Gardens in Mexico, the site owner thought that having the architect design a new chapel for the grounds was an utterly romantic idea. 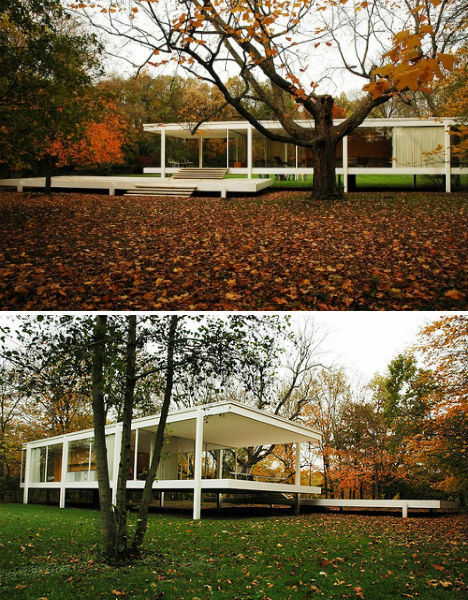 Less romantic were the seemingly endless arguments that followed over the design of the structure; the owner wanted it enclosed and air conditioned, the architect envisioned it open to the elements. The owner preferred a traditional look, the architect desired a modern aesthetic. What resulted is a compromise. To prevent an unwanted greenhouse effect, Bunker used U-profiled glass panes that fit together as a single membrane, allowing ventilation. 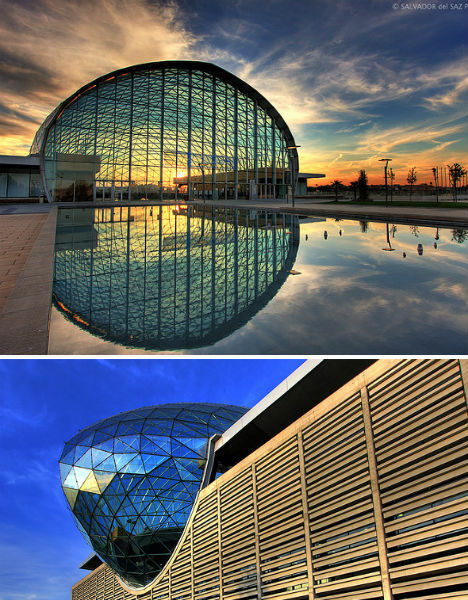 Resembling an oblong glass bubble from above, the Feria Valencia Convention and Exhibition Center reflects into a perfect sphere when viewed from the opposite side of the shallow pond that leads up to its entrance. 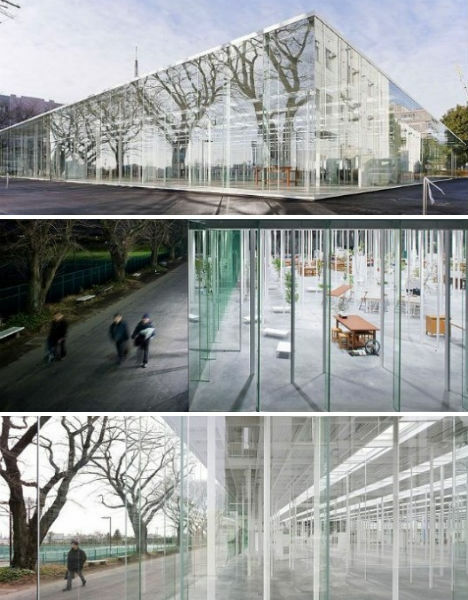 In fact, the stunning glass structure is only the building’s roof. Most of the four-story convention center is underground. This gorgeous prefab house is located in a serene desert setting outside of Joshua Tree National Park in a planned community called Three Junipers. 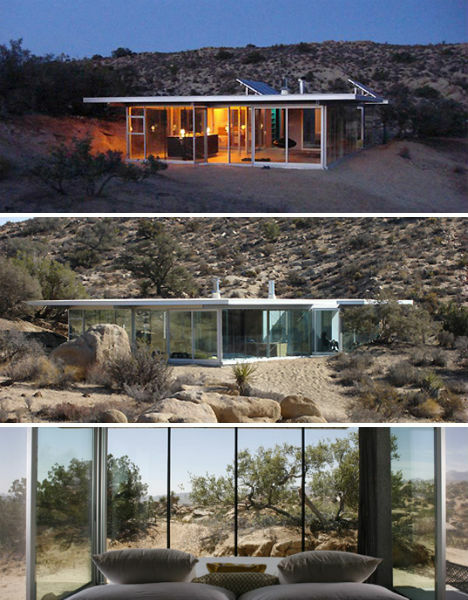 The itHouse, by Taalman Koch Architects, is primarily constructed of glass panels that fit into aluminum frames. Powered solely by photovoltaic and solar thermal energy, the house is off-grid and has a relatively small footprint at 1600 square feet. 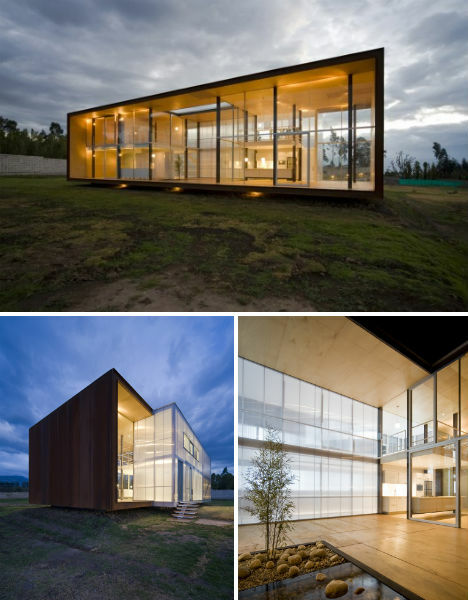 Designing their home without a site in mind, Adrian Moreno Nunez and Maria Samaniego Ponce focused on a design that would fit pretty much anywhere: “an open ended box, whose spatial limits would be the eastern and western ranges of the Andes.” They chose glass because it provides an unlimited sense of space and, in their year-round temperate climate, would not pose any problems with greenhouse effect or lack of sufficient insulation. 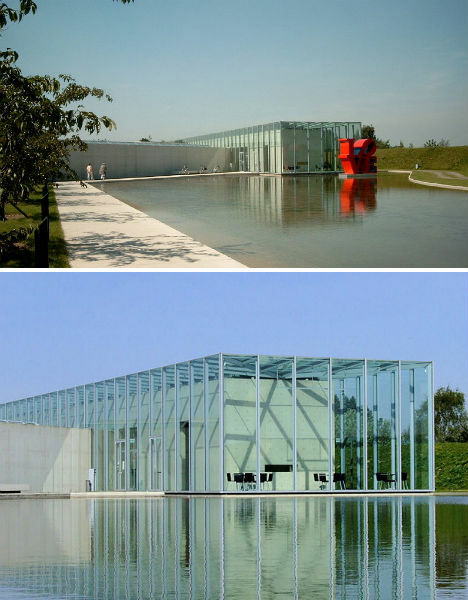 Located in Neuss, Germany at the Raketenstation Hombroich, a former NATO base, the Langen Foundation is a museum storing the collection of Oriental Art and Modern Art. Visitors enter this Tadao Ando-designed complex through a cutout in a curving concrete wall, their eyes immediately drawn to the building’s distinctive glass envelope. This envelope not only provides covered corridors around the concrete core, but also reflects on the shallow man-made pond upon which it is partially set.